We'd recommend Infinite to anyone looking to get into 2D fighters, who wants to learn and have chance to practice their moves in easy-going Arcade and Story modes. Because Infinite operates on that key fighting game maxim: it's easy to learn, but difficult to master. There's something rather special about being able to form a team of Iron Man and Rocket Raccoon and face off against some of Capcom's biggest and baddest characters. Marvel vs Capcom: Infinite makes that possible in the most bombastic of ways. 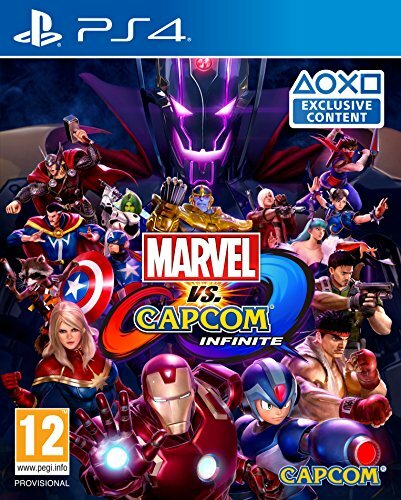 Infinite also escalates the action from the previous game - Marvel Vs Capcom 3: Fate of Two Worlds - but simultaneously takes some steps back, too. The rebalancing and shift of the game's mechanics make for a very different experience for anyone that's used to the previous iterations of the game. For newcomers, however, it's arguably a more accessible and rewarding experience. One with a storyline that's cheesy as hell, but with beat-'em-up fun that makes it worthwhile. Marvel vs Capcom Infinite review: What's new for the series? The first and most noticeable change in Infinite is the reduction of players: instead of three versus three, the game now focuses around a two versus two brawling mechanic. This means there is slightly less chaos when calling in multiple characters to assist and support you in one go - making the game more accessible to players who just want to engage in a Marvel-themed brawl without really thinking about the ins and outs of how fighting games work. There's also an easy combo mechanic baked into the game that makes it easier for new players to understand exactly how the combo chains work and how you can play around with them. Starting with your character's light attack, moving clockwise around the controller's face buttons sees your character pull off some incredible moves. This plays into the idea of empowering new players by learning the timing of these auto combos and how they can be blocked and intercepted. That you can rise through the combo chain and end up with a pretty cool-looking 'super' - even if you have no technical proficiency in games like this - is a huge bonus for Marvel vs Capcom newbies. There's also newly added Infinity Stones. These are a mechanic that returns from the Marvel Super Heroes arcade game and which grant unique abilities in battle, plus offset some of your character's' weaknesses to boot. Using the Time Stone, for example, you can quickly and easily close the gap with your opponents and make slow characters much more in-your-face and dangerous. Marvel vs Capcom Infinite review: The best fighter for newcomers and experts? But that isn't to say there's nothing in the game for the sort of players who own their own fight stick: there is such an extensive roster in the game that even after over 10 hours of play, we're still finding combinations of characters that work really well together. Combined move lists are so extensive, that even if you commit to a base duo of characters you'll still be experimenting in the practice lab for hours until you're satisfied. The roster is a solid mix of rushdown characters, grapplers and zone-control characters, and playing around to find out which two fit your fighting style (and how you can use them against other teams) is one of the best bits about Infinite. On top of that, the Infinity Stones add a new layer to the action. The Power Stone will let weaker characters (we're looking at you, Arthur) be able to smack opponents away, giving room to setup good combos. When you charge up the Stone to unleash its Infinity Storm super, you'll be able to increase attack power exponentially: making for a much greater threat, and giving your opponent another thing to worry about in the later stages of the fight. As comeback mechanics in fighting games go, Power Stones switch up fights. They let you play around with a lot of different mechanics, and potentially devastate your opponents, but you've got to know what you're doing first: you can't just activate the Stone, start button-mashing and come away victorious. Their inclusion is a good mix of powerful and technical, which makes the last third of most good matches pretty unpredictable. You'll also notice that the backgrounds - whilst no-where near as detailed as the pixel art entries in the MvC series - will change and disrupt when you pull of certain attacks. Seeing how the developers have merged Capcom worlds with Marvel worlds is inspired, and picking up on some of the very subtle references to both the MCU and the wider Capcom universe is sure to get fans of either franchise pretty excited. Marvel vs Capcom Infinite review: A story as good as a Marvel Cinematic Universe film? Infinite's story mode - whilst entertaining and absolutely brimming with fan-service - is pretty poor. It's incredibly cheesy - which suits the mash-up of worlds - but it's written like a tongue-in-cheek Marvel film, which lacks any of the charm or delivery the Cinematic Universe manages to convey. The voice acting can occasionally be so bad its cringe-worthy, and the character models look unusually poor. Losing the cartoon-based graphics of the previous games in favour of a more "realistic" style has damaged the overall aesthetic. Some characters suit the look, but others - Rocket Raccoon, Gamora, even Hulk - look really odd in Capcom's engine. It's not game-breaking, but you can't help but notice it. The Arcade mode and Story mode certainly kill a bit of time if you're waiting for other players to get together so you can get a fight in, but the game is definitely not worth the price of admission just to play through these modes - if you're a single-player fighting game fan who wants to play through the story of your games, the likes of Injustice 2 or even Tekken 7 might be a better bet. Marvel vs Capcom: Infinite is a pretty good technical fighting game. But it's not without its troubles: the graphical style, cheesy story and reused assets from the previous game being the most obvious examples. While it's a shame there are some notable omissions from the roster - the X-Men and Deadpool are all missing, thanks to Fox's rights to the characters - the rest of the crew really do shore up the game and make for a fun, eclectic brawler that's full of character and style.